379 subglacial lakes have now been identified beneath the Antarctic continent. 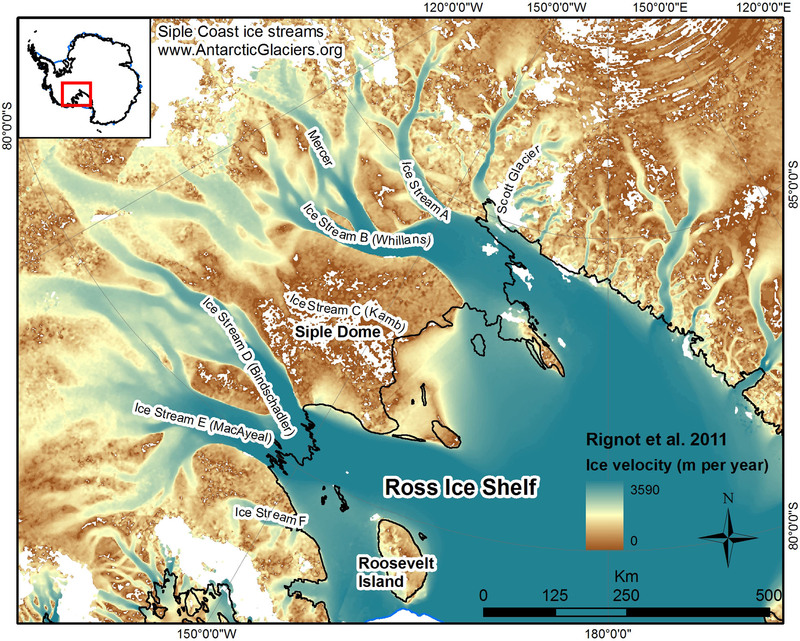 This map, using data from Wright and Siegert 2012  shows that many are located in ice-stream onset zones as well as underneath slow-moving ice domes. The Antarctic continent is underlain by subglacial lakes. Despite the fact that they are overlain by several kilometres of ice, these lakes are interconnected and water flows from lake to lake. Some of these lakes may have been isolated from the outside world for up to 35 million years, and may be final refuges for life, the like of which exists nowhere else on Earth. Antarctic subglacial lakes may cause changes in ice flow, by draining rapidly and lubricating the ice-bed interface, allowing ice streams to flow even more rapidly. Despite the fact that they are overlain by up to 4000 m of dense ice, changes in subglacial lake levels are observable at the ice surface. Recent inventories have found 379 lakes in Antarctica – and we are bound to find more . Over the last few decades, airborne radio-echo sounding has been used to identify a number of lakes beneath the Antarctic Ice Sheet. These lakes were first identified in 1970. The rough topography of the bedrock beneath the Antarctic Ice Sheet is conducive to lake formation, with lakes lying in topographic hollows. Several hundred (379) subglacial lakes have now been mapped[1, 3]. The largest is Lake Vostok in East Antarctica (240 km long, 50 km wide and hundreds of metres deep), which is of significant interest to researchers because of its potential to harbour life. Subglacial lakes have an ice-water interface that slopes eleven times more than the ice-surface gradient (but in the opposite direction and if they are in hydrostatic equilibrium). The pressure melting point along the upper boundary of the lake is dependent on overall ice thickness and is variable. There are therefore density contrasts between meltwater and the main body of lake water, which results in circulation within the lake. Satellite images and airbourne radio echo-sounding have been used to identify flat regions on the ice-sheet surface. These flat areas have subglacial lakes beneath them. Radio echo-sounding works by emitting a radio wave from an aeroplane. This is reflected off contrasting boundaries (such as air/ice, ice/water, ice/sediment). This radio wave is then received by the aeroplane, and yields ice-thickness data to within 1.5% accuracy. These aeroplanes emit radio waves regularly, obtaining cross-sections of the ice sheet. Up to 280 lakes have now been identified using radio echo sounding, mostly under the plateau of the East Antarctic Ice Sheet. A very flat and horizontal character (mirror-like) with slopes less than 1%. Lakes are clustered in the Dome C and Ridge B regions in East Antarctica and along the ice divide, dividing the West and East Antarctic Ice Sheets. They also occur under Titan Dome[1, 2, 3]. They therefore generally occur in regions of slow ice velocities or at ice divides[cf. Rignot et al. 2011, 6]. However, some of the lakes are located away from the ice divides, close to the onset of enhanced ice sheet flow. The average ice thickness above subglacial lakes is about 3000 m, consistent with the tendency of the lakes to be located under thick ice near ice divides. The lakes may be concentrated in these areas because sparse geological information and modelling suggest that the bed may be above pressure melting point here (possibly as a result of geothermal heating). These lakes, including Lake Vostok, appear to drain and fill slowly. Frozen lake ice above Lake Vostok has been cored and sampled, yielding information about the chemistry and biology of the lake. This lake has between 3750 and 4150 m of ice above it[4, 7], and is 14,000 km2 in area. It lies within a subglacial topographic basin, similar to a rift valley. It is at least 1000 m deep in the south, but relatively shallow in its northern and southwest corners. Glacial sediments drape the lake floor. 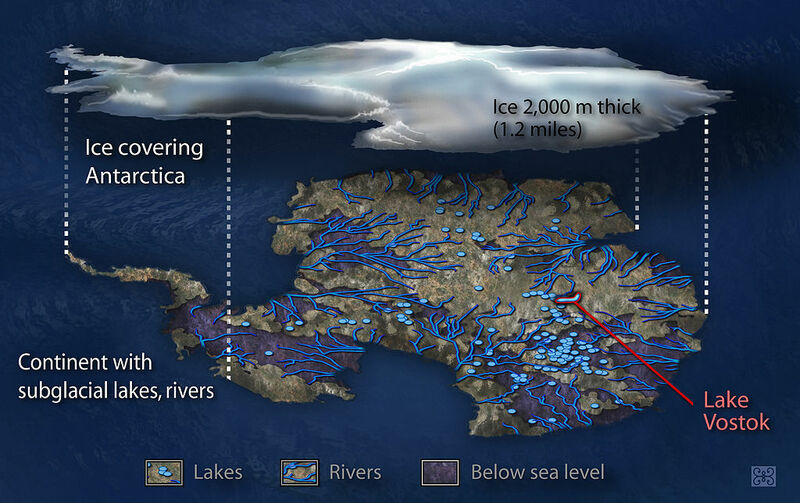 Active subglacial lakes in Antarctica (credit: Ben Smith, University of Washington, and NASA). NASA’s repeat-track Ice, Cloud and Land Elevation Satellite (ICEsat) uses laser altimeter data to measure height changes at a high resolution. ICEsat satellite observations of subglacial lakes has shown that the ice surface above subglacial lakes is constantly changing, suggesting that water is flowing between lakes[5,8]. These lakes, identified in regions of ice-stream onset zones, and characterised by changes in elevation, are considered active, whilst the lakes identified by RES under thicker ice under Dome C, for example, are considered inactive. Smith et al. (2009) recently identified that, out of the 280 lakes mapped, there were 124 active lakes under the Antarctic Ice Sheet. These lakes are rapidly changing in elevation, filling and draining on timescales of months to years. The location of subglacial lakes is important, because the presence of meltwater and saturated subglacial sediments facilitates rapid ice velocity (see Ice streams). Water-saturated sediments reduce basal shear stress, allowing basal sliding at low driving stresses[6, 9]. Changes in the subglacial hydraulic system can result in rapid changes in glacier velocities. Across Antarctica, large subglacial reservoirs have been recently found under ice streams and outlet glaciers. For example, several lakes, together similar in size to Lake Vostok, have been found in the onset region of the Recovery Glacier ice stream in East Antarctica. These subglacial lakes initiate and main the rapid ice flow in the downstream ice streams by changing the basal thermal regime and changing basal lubrication[5, 8, 11]. In this region, four large lakes and eleven smaller lakes have been mapped. Across these regions, ice-sheet surface elevations change by the discharge and filling of these lakes. The surface of these ice streams and glaciers changes in height in response to subglacial water motion[13, 14], with lake volumes changing on annual timescales or faster. The drainage of these lakes has been linked to accelerated ice flow rates, for example, in the Byrd Glacier system (10% faster for more than one year)[5, 11]. Lakes may exchange water with other lakes, or with the surrounding glacier environment, via englacial or subglacial conduits. This second drainage pattern may help induce faster ice flow via distributed ice drainage systems at the ice-bed interface, which lubricate ice flow. This distributed drainage system means that Antarctica is underlain by lakes and rivers, as shown in this image from NASA. The video below, also from NASA, illustrates ice sheet elevation changes following lake drainage or the lake filling up. For example, subglacial Lake Whillans is a persistent but fluctuating feature (~59 km2) beneath the Whillans Ice Stream (Ice Stream B) in West Antarctica. ICEsat elevation changes, GPS observations and seismic data have shown in excellent detail Subglacial Lake Whillans for the period 2003-2009. The lake is ~8 to 12 m deep (low to high stand). Whillans Ice Stream flows at 300 metres per year, moving in short, diurnal or semi-diurnal spurts, which long periods of slower flow[8, 16]. This ice stream appears recently to have been decelerating[17, 18] – see Ice Streams. Here, you can see the NASA website for subglacial lakes, with changing lake levels affecting ice surface elevation. Active lakes appear important to short- and long-term glacier flow. Recent and future research is focussing on testing this hypothesis, examining the data for evidence of direct connections between changes in ice-flow rates and lake activity. More high-resolution satellite data is required for this. Active lakes potentially affect ice dynamics and ice velocities by changing basal shear stress at the lake, and changing the basal water system of the glacier. Following drainage, basal shear stress increases, resulting in slower ice velocities. The extent to which this occurs remains to be tested. However, even partial lake drainage would increase the amount of water available in the subglacial drainage system (within its subglacial canals and channels). Lubrication over large areas of active ice streams would result in increases in glacier velocity. The sensitivity of a glacier is dependent on the spatial extent to which water is distributed across the ice-bed interface, and the nature of the ice-bed interface itself. But why do lakes form in the onset zones of ice streams anyway? Recent numerical modelling studies have suggested that these onset zones are characterised by highly variable basal traction and shear stress. These regions generally have strong topographic features and rugged relief. The energy released by ice sliding over regions with high basal traction results in water being produced, which infills topographic lows as a lake. There is currently a number of nations attempting to drill into various active subglacial lakes, including Lake Vostok, Lake Whillans and Lake Ellseworth. There is an active British attempt to drill into Subglacial Lake Ellsworth[21, 22], which can be read about in detail here. The difficulty is in avoiding lake contamination. 1. Wright, A., and Siegert, M. (2012). A fourth inventory of Antarctic subglacial lakes. Antarctic Science 24, 659-664. 2. Siegert, M.J., 2000. Antarctic subglacial lakes. Earth-Science Reviews, 2000. 50(1–2): p. 29-50. 3. Siegert, M.J., Carter, S., Tabacco, I., Popov, S., and Blankenship, D.D., 2005. A revised inventory of Antarctic subglacial lakes. Antarctic Science, 2005. 17(03): p. 453-460. 4. Siegert, M.J., Ellis-Evans, C., Tranter, M., Mayer, C., Petit, J.R., Salamatin, A.N., and Priscu, J.C., 2001. Physical, chemical and biological processes in Lake Vostok and other Antarctic subglacial lakes. Nature, 2001. 414: p. 603-609. 5. Smith, B.E., Fricker, H.A., Joughin, I.R., and Tulaczyk, S., 2009. 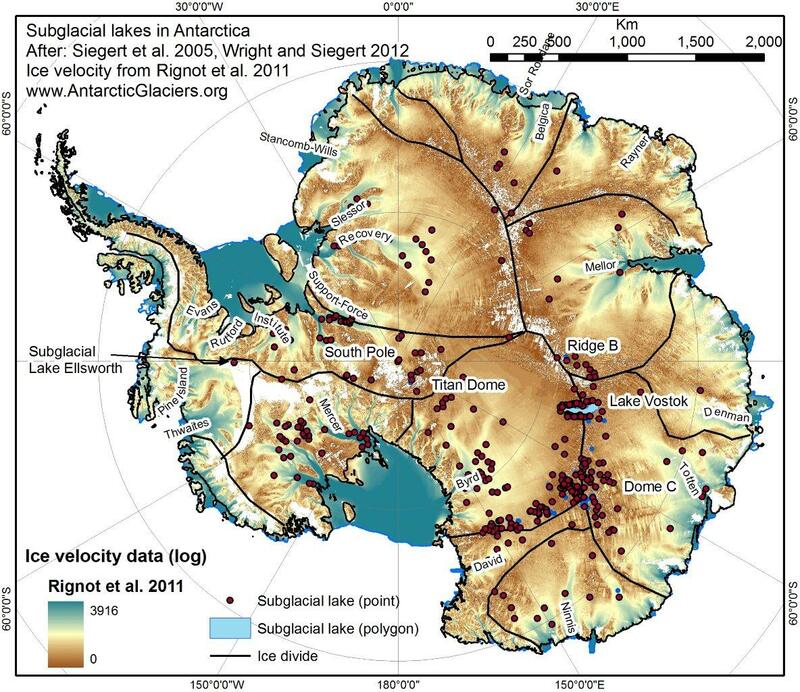 An inventory of active subglacial lakes in Antarctica detected by ICESat (2003-2008). Journal of Glaciology, 2009. 55(192): p. 573-595. 6. Rignot, E., Mouginot, J., and Scheuchl, B., 2011. Ice Flow of the Antarctic Ice Sheet. Science, 2011. 7. Siegert, M.J., Kwok, R., Mayer, C., and Hubbard, B., 2000. 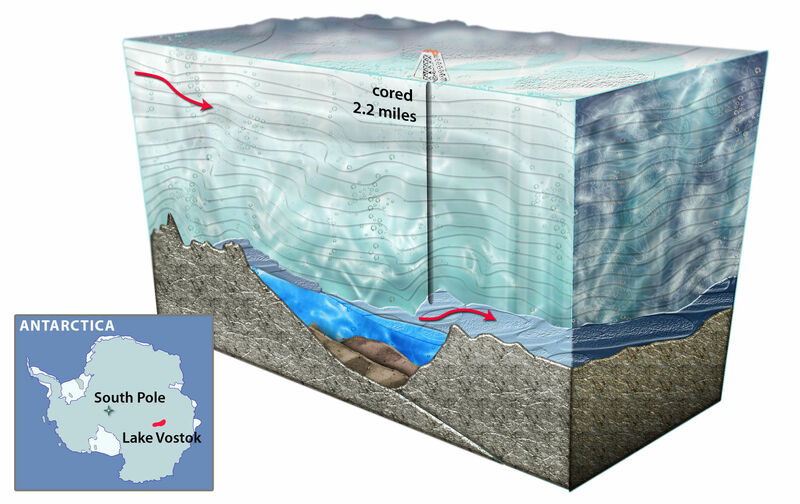 Water exchange between the subglacial Lake Vostok and the overlying ice sheet. Nature, 2000. 403(6770): p. 643-646. 8. Horgan, H.J., Anandakrishnan, S., Jacobel, R.W., Christianson, K., Alley, R.B., Heeszel, D.S., Picotti, S., and Walter, J.I., 2012. Subglacial Lake Whillans — Seismic observations of a shallow active reservoir beneath a West Antarctic ice stream. Earth and Planetary Science Letters, 2012. 331–332(0): p. 201-209. 9. Kamb, B., 2001. Basal zone of the West Antarctic ice streams and its role in lubrication of their rapid motion, in The West Antarctic Ice Sheet: behaviour and environment, R.B. Alley and R. Bindschadler, Editors. American Geophysical Union. Antarctic Research Series 77: Washington DC. p. 157-199. 10. Bell, R.E., Studinger, M., Shuman, C.A., Fahnestock, M.A., and Joughin, I., 2007. Large subglacial lakes in East Antarctica at the onset of fast-flowing ice streams. Nature, 2007. 445(7130): p. 904-907. 11. Stearns, L.A., Smith, B.E., and Hamilton, G.S., 2008. Increased flow speed on a large East Antarctic outlet glacier caused by subglacial floods. Nature Geosci, 2008. 1(12): p. 827-831. 12. Langley, K., Kohler, J., Matsuoka, K., Sinisalo, A., Scambos, T., Neumann, T., Muto, A., Winther, J.G., and Albert, M., 2011. Recovery Lakes, East Antarctica: Radar assessment of sub-glacial water extent. Geophys. Res. Lett., 2011. 38(5): p. L05501. 13. Wingham, D.J., Siegert, M.J., Shepherd, A., and Muir, A.S., 2006. Rapid discharge connects Antarctic subglacial lakes. Nature, 2006. 440(7087): p. 1033-1036. 14. Fricker, H.A., Scambos, T., Bindschadler, R., and Padman, L., 2007. An Active Subglacial Water System in West Antarctica Mapped from Space. Science, 2007. 315(5818): p. 1544-1548. 15. Fricker, H.A. and Scambos, T., 2009. Connected subglacial lake activity on lower Mercer and Whillans Ice Streams, West Antarctica, 20032008. Journal of Glaciology, 2009. 55(190): p. 303-315. 16. Bindschadler, R.A., Vornberger, P.L., King, M.A., and Padman, L., 2003. Tidally driven stickslip motion in the mouth of Whillans Ice Stream, Antarctica. Annals of Glaciology, 2003. 36(1): p. 263-272. 17. Joughin, I., Bindschadler, R.A., King, M.A., Voigt, D., Alley, R.B., Anandakrishnan, S., Horgan, H., Peters, L., Winberry, P., Das, S.B., and Catania, G., 2005. Continued deceleration of Whillans Ice Stream, West Antarctica. Geophysical Research Letters, 2005. 32(22): p. L22501. 18. Joughin, I., Tulaczyk, S., Bindschadler, R., and Price, S.F., 2002. Changes in west Antarctic ice stream velocities: Observation and analysis. J. Geophys. Res., 2002. 107(B11): p. 2289. 19. Sergienko, O. and Hulbe, C., 2011. “Sticky spots” and subglacial lakes under ice streams of the Siple Coast, Antarctica. Annals of Glaciology, 2011. 52(58): p. 18-22. 20. Bulat, S.A., Alekhina, I.A., Marie, D., Martins, J., and Petit, J.R., 2011. Searching for life in extreme environments relevant to Jovian’s Europa: Lessons from subglacial ice studies at Lake Vostok (East Antarctica). Advances in Space Research, 2011. 48(4): p. 697-701. 21. Vaughan, D.G., Rivera, A., Woodward, J., Corr, H.F.J., Wendt, J., and Zamora, R., 2007. Topographic and hydrological controls on Subglacial Lake Ellsworth, West Antarctica. Geophys. Res. Lett., 2007. 34(18): p. L18501. 22. Woodward, J., Smith, A.M., Ross, N., Thoma, M., Corr, H.F.J., King, E.C., King, M.A., Grosfeld, K., Tranter, M., and Siegert, M.J., 2010. Location for direct access to subglacial Lake Ellsworth: An assessment of geophysical data and modeling. Geophys. Res. Lett., 2010. 37(11): p. L11501.